Hardboard puzzles sublimate better and last much longer than the usual cardboard puzzles. 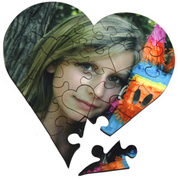 Each puzzle includes a clear plastic presentation sleeve to make for an attractive display or gift giving. Unisub 25 Piece Heart - 6.7"x6.7"
Unisub 30 Piece Rectangle - 6.88"x9.84"